Learn how to prioritize wireless traffic by using Wi-Fi Multimedia to give selected traffic preferential treatment and to move business applications and multimedia traffic to the network edge. Network administrators have long used techniques like 802.1d and DiffServ to give selected traffic preferential treatment. As wireless LANs (WLANs) mature from handling casual Internet access to carrying challenging business applications and multimedia traffic, prioritization must be extended to the wireless edge. This can be accomplished using Wi-Fi Multimedia. Wi-Fi Multi Media, also known as Wireless Multimedia Extensions (WME), is a subset of IEEE 802.11e MAC Enhancements for Quality of Service (QoS). 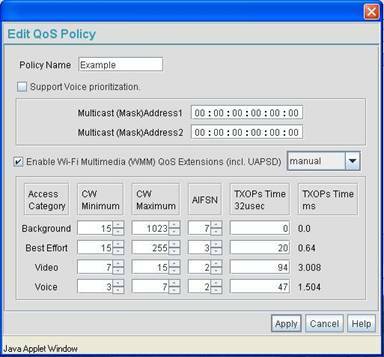 This amendment specifies 802.11 extensions to optimize application performance in WLANs that carry a mixture of voice, audio and video. Specifically, 802.11e defines two ways to control airtime use: prioritization using Enhanced Distribution Channel Access (EDCA) and scheduling using the Hybrid Coordination Function (HCF). EDCA matured well before its contentious sibling. However, before 802.11e could be finalized, proprietary methods began to emerge. To nip interoperability problems in the bud, the Wi-Fi Alliance established the WMM certification program. Four years later, over 850 products have passed WMM tests for prioritizing airtime using EDCA. 802.11g slowdown tackled, but does it matter? 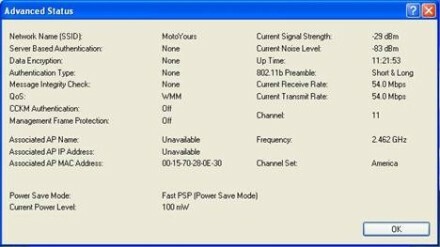 802.11e also specifies a Power Save (PS) extension to help conserve battery life. PS lets clients sleep between transmissions to reduce power consumption. 802.11e improves PS by giving clients (and their applications) better control over when they can ask for data received while asleep. In late 2005, the Wi-Fi Alliance established another program -- WMM Power Save -- to promote interoperable implementation of this enhancement. In situations where all applications and users deserve the same treatment and access is not crucial, priority is irrelevant. But RF channels are shared media. 802.11 clients use a Distributed Coordination Function (DCF) to play nicely with others contending for the same channel. Whenever a client has data to send, it first listens to determine whether someone else is transmitting. If the channel is busy, the client must wait a random back-off period before trying again. DCF is fine when airtime is plentiful. But when diverse applications share the same WLAN, bandwidth hogs -- like media players -- can starve other users. Furthermore, as load increases, everyone suffers by waiting longer to transmit. Brief delays may go unnoticed when Web surfing, but a gap of just 100 milliseconds can cause voice call drop outs. Buffering makes streaming less vulnerable, but audio and video applications still need consistent chunks of airtime to perform well. WMM uses sender-specified priority to provide every application with its "fair share" of the channel. Note that WMM cannot guarantee airtime -- a device that refuses to play fair can still transmit for long periods and block everyone else out. Nonetheless, WMM is an important building block for keeping everyone happy in multi-media WLANs. Toll-quality VoIP calls requiring low latency. SDTV or HDTV video streams. 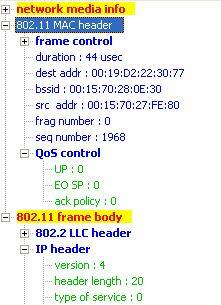 Arbitrary Inter-Frame Space Number (AIFSN) controls how long the client waits after each transmission. 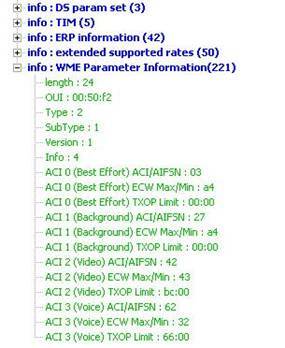 AIFSN defaults range from 2 timeslots for voice to 7 timeslots for the background traffic. Contention Window (CW) controls the random back-off interval used when channel is busy. By default, Background and Best Effort min and max CW are twice as long as those used for Video and four times those used for Voice. The net result is that higher-priority frames receive more "transmit opportunities" than lower-priority frames. When several queues have data to send, high priority queues also get serviced more often than lower priority queues. Without prioritization, airtime competition can significantly degrade voice quality. On the flip side, because VoIP sends many short packets, even one phone call keeps a channel pretty busy. WMM prioritization stops latency-sensitive applications like VoIP from being crippled by delay and jitter, while preventing low-priority applications from being shut out altogether. (To hear the difference, listen to this Interop 2006 demo.) WMM Power Save further improves life for small devices like VoIP handsets and media players that are latency-sensitive by letting them "doze" longer without degrading quality. If your WLAN is composed of recent devices -- especially business APs and VoIP handsets -- you probably have the equipment to take advantage of WMM. To determine whether your gear supports WMM, search the Wi-Fi Alliance's certified products list. Frame 1, at left, is an untagged frame (IP Type of Service 0). 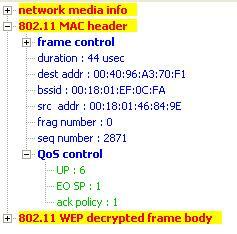 Frame 2, at right is an encrypted frame with User Priority 6. Although that IP packet is obscured by encryption, we know that it carries Type of Service=6, which WMM mapped to the Voice category. Indeed, the packet on the right was generated by a QoS-aware softphone program. In fact, tagging is a critical step. Purpose-built Wi-Fi devices that are WMM-capable often run software that tags outbound packets. Examples include Wi-Fi SIP Phones like SMC Tigervoip and Cisco Unified Wireless IP phones, dual-mode Smartphones like RIM BlackBerry 8820 and Sony Ericsson W960i, media centers like Linksys DMA2100 and Philips MCP9360i, and Set Top Box/DVRs like HP MediaSmart Connect. On general-purpose devices like laptops, start with a WMM-capable adapter like the Dell and Cisco cards mentioned above. However, applications must also be developed to use WMM. To learn more about Windows applications, see Microsoft QoS Support and Vista WMM Support articles. However, enabling WMM only prioritizes airtime. Additional AP and/or Controller parameters determine how QoS operates within the AP and how packets are tagged at ingress/egress interfaces. 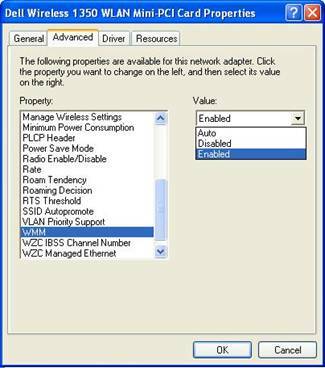 For example, your AP may let you specify WMM ACs applied to traffic sent to individual clients (MAC addresses) or applications (TCP/UDP ports). Or you have control over how inbound DSCP or 802.1d tags are mapped to outbound packets, regardless of application payload. Many business-grade APs offer further bandwidth management features, like weighted queuing when a radio/channel supports several virtual APs, or traffic shaping based on IP Type of Service. These capabilities vary quite a bit, so examine your own gear and how it fits WMM into "big picture" QoS. To learn more about WMM and end-to-end QoS management for voice over Wi-Fi, see the Wi-Fi Alliance's Voice-Personal and upcoming Voice-Enterprise programs. 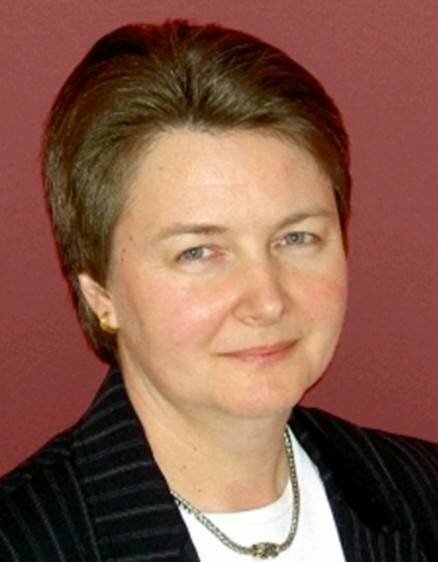 Lisa A. Phifer is vice president of Core Competence Inc. She has been involved in the design, implementation and evaluation of data communications, internetworking, security and network management products for more than 20 years and has advised companies large and small regarding security needs, product assessment and the use of emerging technologies and best practices. 5G expansion is coming, but where will operators reap profits?